I wouldn't necessarily think of Paul Dano and John Cusack looking alike to play the same character, but it really worked here. Dano is the younger Brian Wilson, at the height of success and on the verge of psychosis. 20 years later, Cusack is a very weathered Brian Wilson, one who did not have much of a handle on himself or reality after years of suffering with psychosis and a therapist heavily medicating him. The tragic nature of his adult life can make the film a tough watch, especially since it's contrasted so much with the Beach Boys' rise to fame. Paul Dano. Courtesy of eOne Films. The movie starts after “Surfin' USA”, “Surfer Girl” and “Fun, Fun, Fun” when the Beach Boys were hugely popular, but Brian Wilson stopped touring with the band and stayed at home to produce music. This section was really interesting seeing Dano as the younger Brian write, develop and produce “God Only Knows” and “Pet Sounds”. We actually watched the songs develop from simple piano pieces, to full orchestra instrumentals with multiple different arrangements, and the final produced piece. It was like a lesson in music producing from one of the most influential artists. It was also during this time that Brian Wilson got heavily into psychoactive drugs and cocaine, heroine, LSD and probably everything else he could get his hands on. When the drug use started playing into his psychosis, the film would revert to his point of view and we would get a cacophony of visual and auditory hallucinations. While it wasn't as psychedelic as other films have done, it is very disorienting and unsettling. His song writing during this period does serve as an interesting juxtaposition to the summertime fun songs that the Beach Boys are best known for. And it's also what formed his adult life, which the film flips back and forth to. Paul Giamatti, John Cusack and Elizabeth Banks. Courtesy of eOne Films. This film version of adult Brian Wilson is very tragic as he was under the influence of many prescribed psychotropic drugs by a shady therapist. He also says things so stark and tragic right out of the blue that you would laugh, except you don't want to laugh because it's so tragic. But it's also during this period that we meet Melinda Ledbetter (Elizabeth Banks), a former model that Brian falls in love with. Banks' Melinda is a fantastic character – one that tries to put Brian's needs above her own, but still has to look out for her own safety and interests. 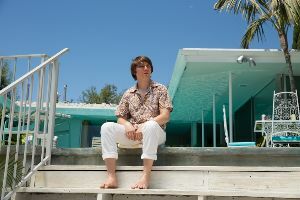 Love & Mercy is a very fair and respectful tribute to Brian Wilson, structured so that we ultimately get an upbeat ending. But it's not a straight forward biopic and his emerging psychosis can make for an inaccessible and, at times, unpleasant viewing. It does present some very interesting periods of his life, but just like how “Pet Sounds” was first received, it's not the Beach Boys you know and love. Jersey Boys (2014) - Get out of Jersey, get ready for some feel-good fun. Danny Collins (2015) - Family drama that charms with some comedy.